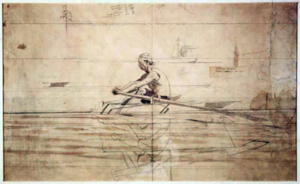 “Eakins the scientist-artist” is a pervasive idea in art history. The perception was clearly present in the public eye during Eakins’ career. The big artist does not sit down like a monkey & copy a coal scuttle or an ugly old woman like some Dutch painters have done… but he keeps a sharp eye on Nature and steals her tools… and appropriates them to his own use. In a big picture you can see what o’clock it is, afternoon or morning, if it’s hot or cold, winter or summer, what kind of people are there, what they are doing, and why they are doing it. Eakins hoped to employ nature’s tools as revealed through science to create artworks of such verisimilitude that the viewer would experience the very reality they depicted, down to climate conditions. Eakins was steady in his employment of techniques derived from science, mathematics, and then-recent technological advances. Perspective in his paintings was worked out through painstaking math. Advanced abilities in optics let him depict complex reflections on the surface of choppy water. His accuracy in anatomy was renowned, and not restricted to humans; this accuracy was buttressed by a busy sideline in dissections. And his embrace of photographic technology led to unprecedented understanding of human and equine kinesiology. Eakins had an additive, holistic approach to painting. He believed that if he employed different theoretical approaches to different problems within a given work (perspective, reflection, anatomy, etc. ), the different techniques should add up to a perfect image. This didn’t work, and indeed couldn’t work, because the body of theory available to him was incomplete, particularly with respect to the way the human eye sees and processes reality. But a bunch of visual problems emerge upon closer inspection. We have the rings left by the oar strokes that appear to have failed to move and dissipate with time, and the way the boat’s wake lingers in a way that it shouldn’t (it’s been pointed out that it looks like the boat is being rowed through clear jell-o). The careful recession of reflected objects is made possible by the elision of reflections of the two bridges in the distance, which should be visible (but which would render the visuals of the water chaotic). The piecemeal application of scientific knowledge fail to add up to a seamless whole, especially when this combination butts up against the visual requirements of a successful painting. (actually at four different points in the stride cycle; a real team of horses wouldn’t work this way, but Eakins was keen to show the entire cycle since he could). Horse models made by Eakins to plot out the gaits. 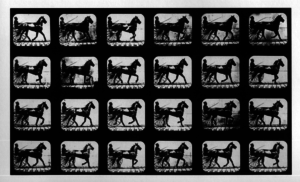 Eadward Muybridge’s photography of a carriage horse. The positions of the horses’ legs were carefully modeled to show accurate equine kinesiology as recently revealed by the photographic work of Eadward Muybridge. But the carriage’s wheels, however, are painted with motion blur obscuring the individual spokes, reproducing the way the human eye would see them in real life. Horse legs clear, wheels blurred, and the result is visually confusing as a painting that seems to present a high degree of realism winds up displaying a visual paradox where the eye is perceiving horses at one “shutter speed” and carriage wheels at another. Eakins “additive method” of piling different theoretical approaches led to visual problems when the techniques failed to add up to a unified whole. You might characterize Eakins as a victim of scientific hubris. 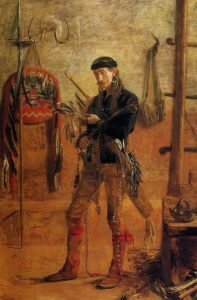 After high school, Eakins relocated to Paris, where he studied under Jean-Léon Gérôme at the Ecole des Beaux-Arts. While there, Eakins’ lecture schedule was nearly as science-oriented as it had been at Central. And remember that all of his educational peers were going through this program, too. Eakins also brought his scientific mindset to bear as a teacher of art. Eakins assumed control of the Pennsylvania Academy of Fine Art in 1882 and radically revamped the curriculum in favor of lectures on mathematical perspective, anatomy (including dissection), working from photography, and life drawing. His direct academic involvement in science and a scientific worldview extended beyond his curricular work at the Pennsylvania Academy. 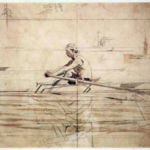 Most notably, in 1884 Eakins was appointed by the University of Pennsylvania’s Board of Trustees to the Muybridge Commission, a body created to “insure [the] thoroughly scientific character” of Eadward Muybridge’s photographic work at the university. Fascinated by Muybridge’s work, Eakins set up his own parallel operation at the University of Pennsylvania, engaging in a technical rivalry with Muybridge to find a better mechanism for capturing motion photography (Muybridge won). This work led to an essay co-published with his colleague Professor William Marks describing Eakins’ alternate photographic mechanism. His other public presentations of his own direct scientific work included an 1885 lecture on the zoetrope and a paper presented in 1894 to the Philadelphia Academy of Natural Sciences about the anatomy and kinesiology of horses, based on his photographic and dissection work. 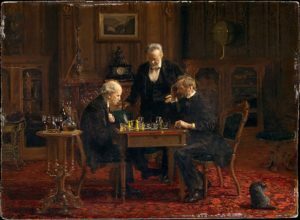 Eakins’ bona fides as a man intellectually enmeshed in the scientific worldview of the late 19th century are easily established. What about his social ties? Ample evidence exists of direct links between Eakins and the wider scientific community, and intellectual elite of Philadelphia. 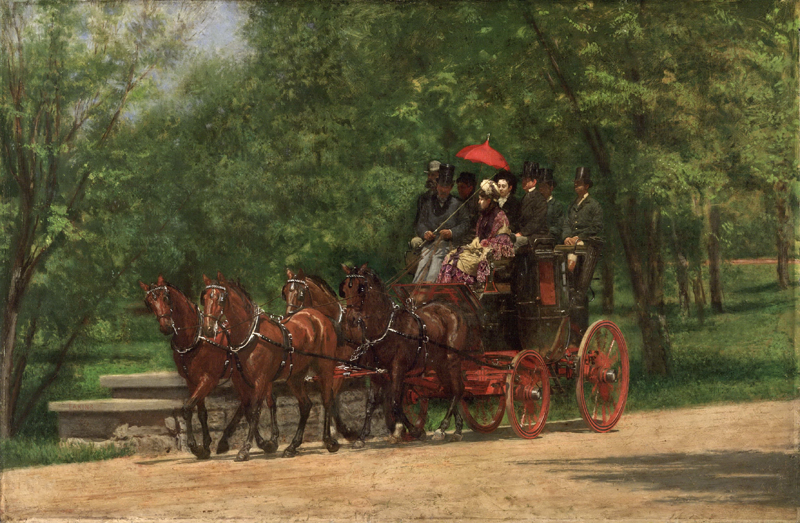 For instance, Fairman Rogers, whose carriage we were just admiring in oil-painting form. Rogers was initially an engineer of note at the University of Pennsylvania. Over time, he became a trustee there, and a founding member of the US National Academy of Sciences. He performed frequent committee work at the Pennsylvania Academy of Fine Arts, including chairing the academy’s Committee on Instruction. Rogers’ interest in the photographic study of motion led to Eadward Muybridge’s relocation to Pennsylvania (he sat on the Muybridge Commission with Eakins). This joint fascination with Muybridge led to Eakins’ work on The Fairman Rogers Four-in-Hand, which both Rogers and Eakins viewed as an exciting opportunity to put their photographic research into horse kinesiology into action. 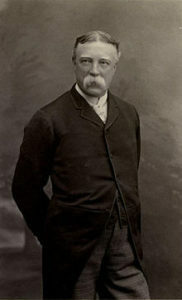 Eakins maintained strong social connections to other members of the Muybridge Commission. Eakins’ wife described the gatherings of University of Pennsylvania-affiliated scientists, musicians, and intellectuals that occurred weekly at the Eakins house as “Tom’s Sunday Club.” Several members of the Sunday Club subsequently sat for portraits by Eakins, including George Barker, a professor of physics, and William Marks. He would seek out other doctors and scientists, mostly from the University of Pennsylvania, painting their portraits for the stimulation of their company as well as to capture his sense of their importance. ‘We get on famously together, our tastes being similar,’ he noted in 1897 of Henry A. Rowland, a physicist from Johns Hopkins University. ‘There is no one in the world who holds a higher position in science than Rowland and it is very good to be able to associate with such people.’ For Eakins, the ‘goodness’ of this experience resided in the understanding gained. Portrait of Henry Augustus Rowland, 1897. Check out the frame. Eakins’ connection to Rowland is an important marker of his direct contact with the forefront of scientific thought. Rowland’s major contribution to physics was his work with diffraction gratings, tools used to break white light down into its component wavelengths for analysis. This cutting edge spectral analysis allowed physicists to determine the chemical composition of distant stars by examining the appearance of gaps in the emitted wavelengths of light. It’s clear that Eakins recognized Rowland’s august stature. 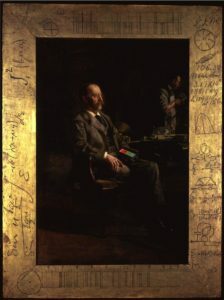 While the portrait of Rowland is competent but unremarkable, Eakins hand-decorated the painting’s frame with drawings and notations celebrating Rowland’s work: equations, graphs, technical diagrams, and two different light spectra. As far as I know, Eakins only indulged in this kind of frame-embellishment on one other painting. Eakins’ ties to Fairman Rogers, Henry Rowland, and the rest of Tom’s Sunday Club establish a direct connection to the frontier of the scientific thought of his time. If Eakins’ worldview was influenced by that world, our next step is clearly to take a look at that state of physics at the end of the 19th century. What was he getting from those scientists? To a degree that’s hard to comprehend in 2018, between the Civil War and 1900 there existed a widespread belief that the frontiers of science were more or less closed. The scientific paradigm operative at the end of the 19th century had begun with Isaac Newton in the mid 17th century, when Newton simultaneously proposed the basic laws by which all motion in observable scales is governed, and developed the new forms of mathematics necessary to describe these laws. Progress continued in an accretive fashion for two centuries. Over the course of the 19th century, Michael Faraday experimentally laid out the behavior of electricity and magnetism. After the Civil War, James Clerk Maxwell and Heinrich Hertz provided a solid mathematical representation of Faraday’s qualitative results. By the late 1890s, physicists thought they had it all together. All of electricity, all of magnetism, all of light, all of mechanics, all moving things, as well as cosmology and gravity — all were understood by a few simple equations. … Had I been teaching back in 1890, I might have been tempted to send my physics students home, advising them to find a more interesting major. All the big questions had been answered. Those issues that were not well understood … well, everyone believed that sooner or later they would yield to the power of the Newton-Maxwell theoretical juggernaut. Physics had been neatly wrapped up in a box and tied with a bow. Or, as Albert Michelson (who helped establish the speed of light) said in 1894: “It seems probable that most of the grand underlying principles have been firmly established … the future truths of physical science are to be looked for in the sixth place of decimals.” The scientists with whom Eakins liked to associate would have been confident that almost everything that could be known was known, that proper mathematical application of the theories of the day could describe all reality, and (by extension) that a program of artistic realism based on science was bound to add up to perfect representation as soon as a few details were worked out. And I’m setting aside the impact of Darwin, but we should remember that he was revolutionizing biology in the same period. A quick look at the popular fiction of the era provides a good example of widespread scientific triumphalism. Consider that science fiction had not existed as a genre before the mid 19th century; Jules Verne’s Twenty Thousand Leagues Under the Sea was published in 1870. It was followed by H. G. Wells’ The Time Machine (1895) and War of the Worlds (1898). Scientific triumphalism extended beyond the nascent genre of science fiction as well; Arthur Conan Doyle introduced Sherlock Holmes, a character who arguably acts as a superhero powered by logic and science, in 1887. Mark Twain built the plots of Pudd’nhead Wilson (1894) and A Connecticut Yankee in King Arthur’s Court (1889) around science. And there is no question that Eakins was socially connected into the intellectual elite on the humanities side as well as the scientific; he knew Walt Whitman well enough to serve as an honorary pallbearer at the poet’s funeral in 1892. 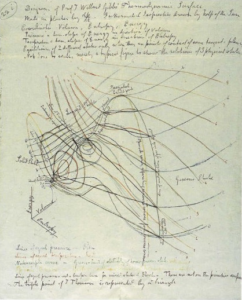 The unraveling of the notion of the end of physics began with the work of Max Planck, who was trying to understand the behavior of light; some of the questions Planck was trying to answer grew out of the spectral analysis enabled by Rowland’s diffraction gratings. The details of this unraveling, while fascinating, are beyond the scope here. The important part is that Planck and Albert Einstein observed that the large body of theory that existed at the turn of the century worked quite well most of the time, but that the components of the theory, when applied in an additive manner to reality, left gaps and discontinuities. The congruence to the situation in Thomas Eakins’ paintings is startling. An interesting parallel exists between Eakins’ additive approach to scientific realism in painting and the basic way that science functions: both are cases of essentially having a toolbox and applying the tools one by one as appropriate. 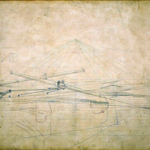 In Eakins’ case, this meant laying out a 3-D grid to establish perspective and then studying motion photographs to depict horse gaits and then consulting an anatomical manual to get musculature correct. In a scientist’s case, it meant using Newton’s equations to determine the acceleration on an object caused by the action of an electric motor, with the motor’s force derived from Maxwell’s equations, and so on. The similarity of Eakins’ approach to the scientific paradigm makes a great deal of sense when one considers his training and social world. I don’t propose that Eakins could sit down and use Maxwell’s equations to determine the force exerted by an electromagnetic field (although I wouldn’t be shocked to learn that he could), but I’m confident that the conversations with scientists at Tom’s Sunday Club reinforced an already-present mindset that everything was worked out, with just a few details left to nail down. Both Eakins and the scientific community to which he was connected had a fallaciously teleological outlook about scientific progress. In other words, they believed that they sat upon a summit that all previous historical progress had been an inexorable march towards. 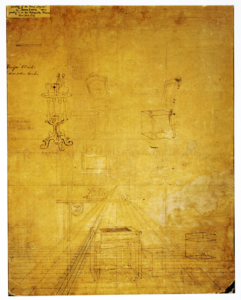 Eakins believed that science had progressed almost to an end point where it could be harnessed to enable flawless representation of reality, and that the problems being experienced on that front were temporary roadblocks that would be overcome as the last few pieces of technique were worked out. The scientists he hung out with believed that science had almost progressed to an end point where everything that existed could be described by a handful of equations based on the work of Newton and Maxwell, and that just a few minor details needed to be ironed out. Both of these beliefs were spectacularly wrong. But the big-picture wrongness of both cases should be kept in perspective. Classical physics turned out to be grossly inadequate to describe the mega- and micro-scale workings of the universe, but it the scientific principles known in 1895 still govern everyday life; when you fly across the country on a jet plane, the work of Newton governs the situation much more than that of Einstein. 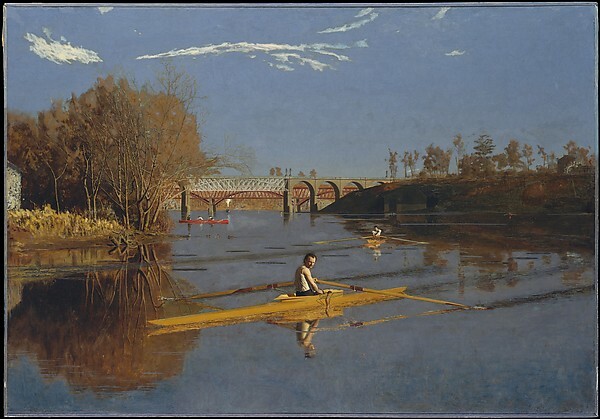 And the paintings of Thomas Eakins might contain spatial and temporal hiccups, but that makes them no less accomplished, fascinating, or even beautiful. Eakins brought much more to painting than a system of scientific techniques. His technical approach may have been incomplete, but the entire world doesn’t need to fall into the gaps.